Lily Gray scored 15 points and Taylor Hardy had 14, including 12 in the third quarter, to lead second seed Deer Isle-Stonington to a 57-28 victory over No. 7 Ashland in their Class D North semifinal at the Cross Insurance Center Monday morning. BANGOR, Maine — Lily Gray scored 15 points and Taylor Hardy had 14, including 12 in the third quarter, to lead second seed Deer Isle-Stonington to a 57-28 victory over No. 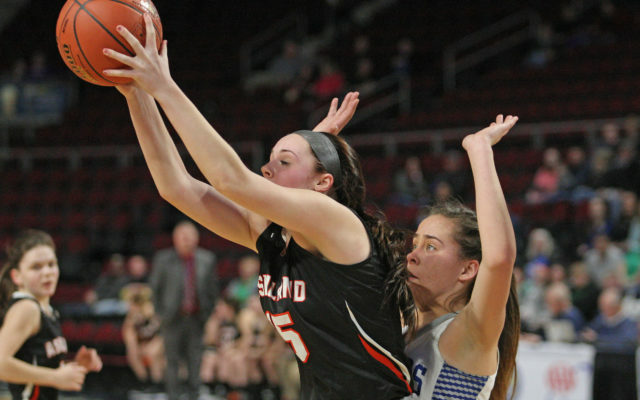 7 Ashland in their Class D North semifinal at the Cross Insurance Center Monday morning. Deer Isle-Stonington is now 17-0 and will take on No. 3 Woodland in Thursday night’s 7:05 semifinal. Ashland, led by Jamie Poulin’s 11 points and Olivia Tardie’s eight, finished at 8-12. Gray had 11 of her points in the first half and she also grabbed three rebounds as Deer Isle-Stonington took a 24-15 lead into the intermission. Morey had seven points, four rebounds and three assists. Hutchinson grabbed nine rebounds and had a basket. Poulin’s seven points and Tardie’s six before intermission paced Ashland, who stayed close for a majority of the first half. However, the two top scorers picked up three fouls each in the half and Deer Isle dominated the third and fourth periods for the lopsided win. This was the third consecutive trip to the tournament for the Hornets, which had previously gone eight consecutive years without getting there.